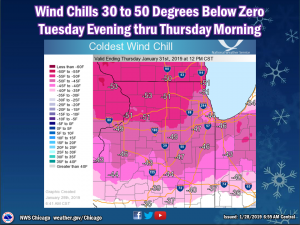 Tuesday through Thursday we all will experience temperatures and wind chills that our homes’ heating systems are NOT designed for. -20 to -30-degree temperatures with wind chills into -40 and up to -50+. 1. Please raise the temperature in your home on Monday, 2 to 4 degrees above your normal setting….